We would need an entire book if we wanted to describe the art of painting. It ought to be presented to us in the guise of a beautiful young female with curly black hair and her mouth bound, wearing a gold chain about her neck from which a larva dangles. In one hand she is holding several brushes and the motto: Imitatio - that is, imitation. The Muses, the daughters of Zeus and the Titaness Mnemosyne, bear resounding names: Calliope ("fair voice"), Euterpe ("gladness"), Terpsichore ("joy in the dance"), Erato ("lovely"), Melpomene ("singing"), Thalia ("abundance" or "aood cheer"), Polymma ("many songs") and Urania ("heavenly"). These sisters were regarded by the ancient Greeks as the goddesses of the fine arts, music and literature. As ancient mythology has it, they lived on Mt Parnassus, a barren limestone spur of the Pindus Mountains in central Greece. On its southern slopes the Delphic oracle of Apollo prophesied in riddles. A consensus was never reached as to the domains over which the individual Muses presided, nevertheless, certain art forms came to be associated with each of them, although some overlapped: poetry and flute-playing, song and dance, comedy and tragedy, pantomime and even the science of astronomy. Yet, painting remained amongst the fields of art to be ignored entirely. The Dutch painter Jan Vermeer van Delft was surely not the first painter to have felt slighted by his art being thus overlooked. However, he was one of the few to feel that he ought to do something about this sorry state of affairs. In short, he took the ninth muse, Clio, as his personal patron. Clio presided over history. Why did Vermeer take this particular Muse as his own and not the poetic allegory proposed by the Italian writer Cesare Ripa, who was widely read in Vermeer's day? Like many of his contemporaries, Vermeer probably saw history painting with a mythological background — the representation of biblical and allegorical scenes — as the major genre in painting. In his Allegory of Painting, Vermeer portrayed Clio as a young girl holding a history book in one hand and a trumpet proclaiming fame in the other. The artist does not seem to have been inspired by his particular Muse all that often. The man from Delft most likely painted only the thirty-four works that are known. 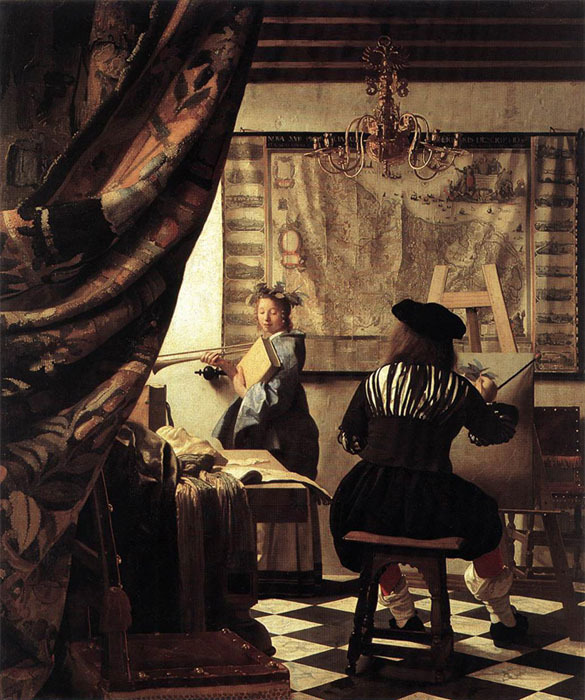 Was Vermeer, in fact, a painter by profession? He is said to have inherited the Mechelen Tavern on the north side of the Delft marketplace from his father in 1652. Later the story goes that he worked as an art dealer. Even that was obviously not enough to keep him financially secure. When Vermeer, who today stands beside Frans Hals and Rembrandt as the most famous seventeenth-century Dutch painter, died in 1675, he left behind eight young children and a destitute widow. One of the first things she did was to give the Delft master-baker Hendrick van Buyten two paintings by her late husband to discharge debts amounting to 617 guilders and 6 stivers.